Singing acts as a "bonding behaviour" among adults, making it easier for people to make new friends, psychologists at Oxford University have found. A study published in the Royal Society’s Open Science journal watched how strangers’ relationships progressed over several months of creative writing, craft and singing classes. 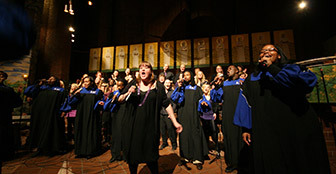 Out of seven courses, the singers became closer much quicker – a result attributed the ice-breaking "power of a good sing-song". Dr Eiluned Pearce, who led the research at Oxford’s Department of Experimental Psychology, said: "One of the key differences between humans and other primates is that we can exist in much larger social groups".